Last month I had the pleasure of meeting a very special woman named Ellen. She is not only the number two fundraiser for Susan G. Komen, she is also a survivor herself, a warrior in pink! Her bravery amazes me and her passion for building awareness and finding a cure is so inspiring. 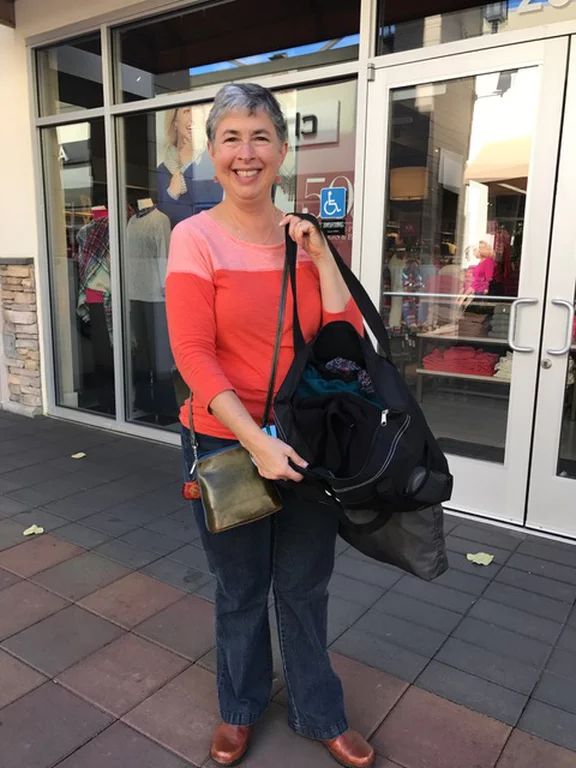 Neither of us had ever shopped with a stranger before, so we had no idea what to expect when we met at the San Francisco Premium Outlets in Livermore, CA. To my pleasant surprise, Ellen was just as excited to pick out a new wardrobe, as I was to help her. We started off our day by picking up our “swag bags” from the Simon kiosk, where they took our photos and so generously gave us gift cards to shop! From there we went straight to the map! We stopped in a store along the way, but Talbots was the destination. 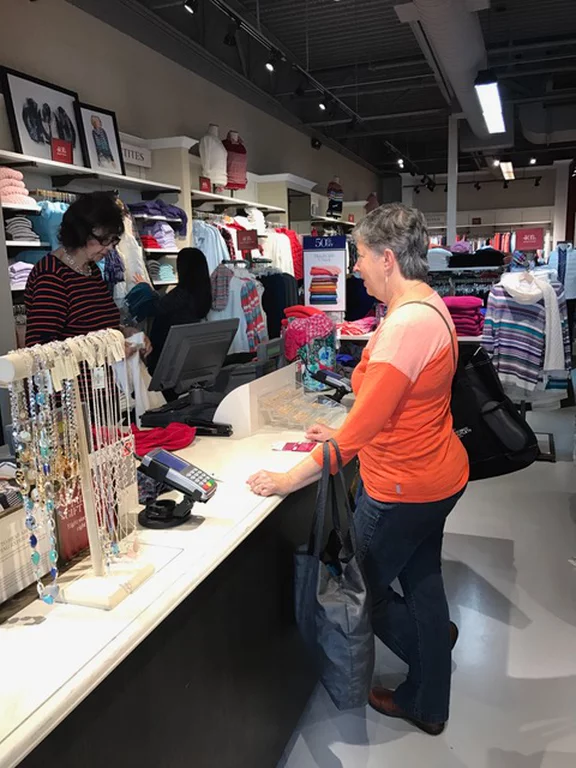 They were having an awesome sale where everything was up to 50% off, So of course we made sure to take full advantage of the promotion and started searching the racks. We talked and shopped. I think that is the best way to break the ice, don’t you? I came to find that both Ellen and her husband were teachers and that she was looking for comfortable, yet stylish clothes to wear to school. Knowing that and a couple of her go-to colors, we were able to pick out quite a few items to have her try on. Before we knew it, it was a full on fashion show in the Talbots dressing room! After a few trips back to the floor, we finally chose some GREAT pieces! 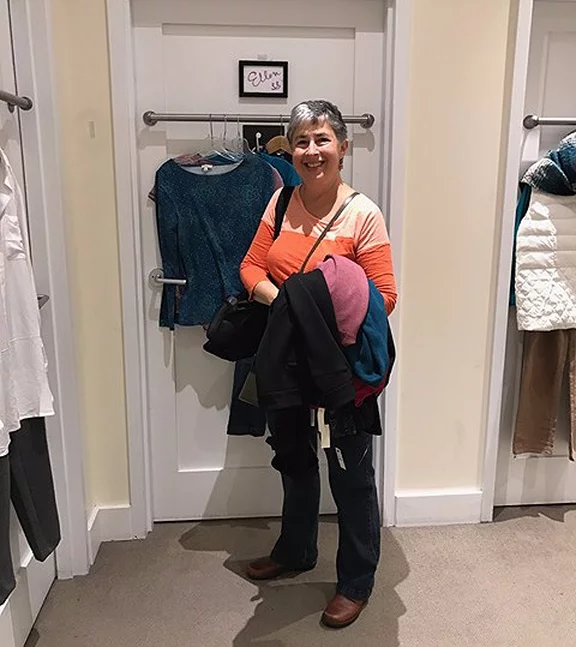 Ellen is going to look amazing in her new clothes and it was all made possible by her generous contributions and fundraising for Susan G. Komen and the wonderful Simon team! I couldn’t just let her leave without hearing her story though. Once she got all of her goodies, we found a nearby bench and that was when I saw how truly brave Ellen was. She spoke about her journey from the time she was diagnosed, all the way to current day. She talked about how her brother-in-law saved her life by running more tests, after the previous doctor had said she was “fine” and sent her home without answers. She spoke about her hopes to build awareness around breast cancer and made it a point to get a second, or third opinion if you think something is wrong. She also wanted to inform people that they should get checked regularly, especially if it runs in your family. Her hope is that everyone becomes more proactive in general because the sooner you find out, the sooner you can fight! After all, breast cancer is more common than you think, with 1 in 8 U.S. women developing the cancer throughout their lifetime. She then sat there fighting back the tears when talking about her dear, childhood friend who had lost the battle to breast cancer and all the people she’s known that have not been as fortunate as her throughout this process. She remained positive throughout each doctor’s visit, every piece of bad news received and each funeral she attended. Her determination to find a cure is inspiring and I can only hope to touch people’s lives the way you have Ellen! If you wish to help Ellen find a cure you can donate by following the link below!